One of the many things to be toured and experienced in Kandy, the Bahiravokanda Vihara Buddha Statue is a huge religious monument. It lies within few meters from Perdeniya and is 88 feet tall statue was provides a very magnificent spectacle. Climbing a few flights of stairs takes you to the calming and peaceful spot created by the monks of Sri Lanka. This tall statue is a perfect getaway from the bustling streets of Kandy and has a mesmerizing panoramic view of the entire city. The climb to the top is very windy and thus is a wonderful and fun experience. Once on the top you can spot the Kandy Lake, football stadium, tea factory and many other attractions of the Kandy city. An added benefit is the mind blowing selfies and photos you can get from this spot, sure to be worthy of hundreds of likes! This statue is built on the bahirava kanda hill which literally means the devil’s hills in Sinhalese. As if the height of the statue wasn’t enough, a stairway built besides the statue can take you to even greater height. What is even more striking is to see this statue lit up at night. This site is worshiped by many tourists and believers of Buddha. Many people offer flowers and light oil lamps at this spot. The government of Sri Lanka is developing this site to attract from tourists from around the world since it has not yet gained the popularity it so deserves. 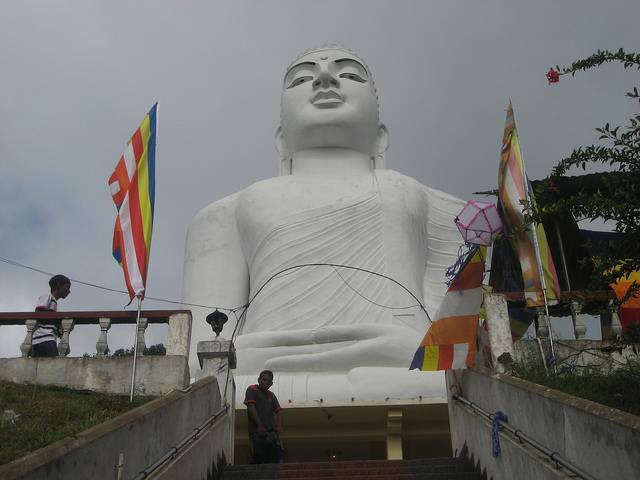 When in Sri Lanka, make a visit to the most spectacular and tallest statue in the country!